What are Your Candy Memories? Editable newsletter text here text here editable newsletter text here editable newsletter text here. If you know of someone who is turning 30, you may be at a loss as to what to get that individual. Buying presents can be incredibly difficult as a person ages. Clothes are no longer relevant to give and a gift card is thoughtless at best. Struggling to find the best ideas for 30thbirthday gifts can be a difficult and time-consuming process. Thankfully, candy gift baskets have you covered when it comes to providing the perfect present to your loved one. A candy gift basket is just one of those gifts that lets your friend or relative know that you care. 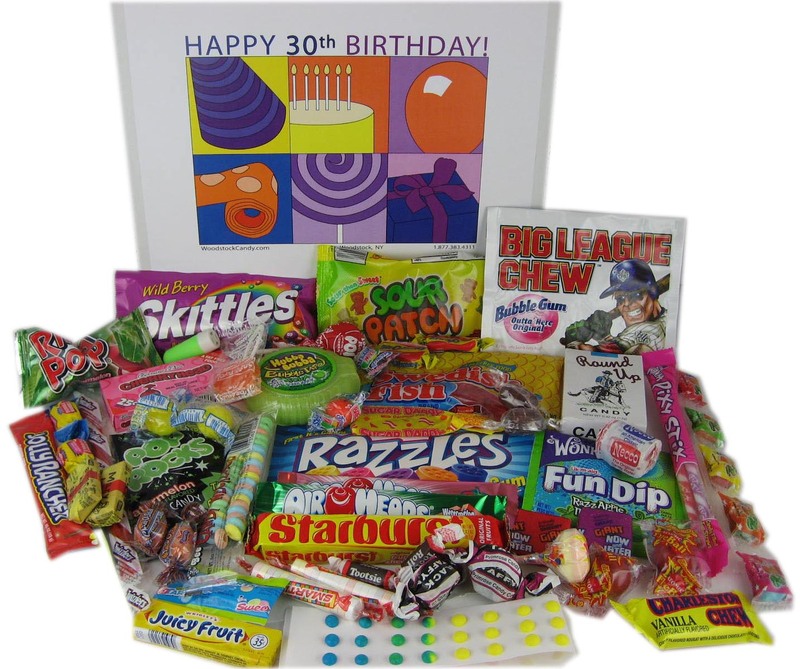 The reason candy gifts are so popular is because you can purchase retro candy for your friend's birthday. This type of candy will bring them back to when they were a kid with all of the sweet treats that the basket has to offer. Giving one of these baskets is one of the best ideas for 30th birthday presents that you can possibly come up with. Candy gifts never go out of style and they can be a truly memorable gift for your loved one when they receive it from you. These baskets are also incredibly affordable no matter what type of budget you are on. The fact of the matter is that 30th birthday gifts are hard to shop for. You may go from one store to another just to find that there is nothing worth buying for your friend. Candy gift baskets, on the other hand, make for great presents. The candy is always fresh, despite the fact that the brands are those you may have known in your childhood. You will be able to choose a beautiful basket depending on the color, size, and type of candy that happens to be within it. The basket can be ordered and delivered straight to your home. You will be able to give the present to your relative or friend when their birthday finally arrives. The candy is always top quality and is guaranteed to be as fresh as possible. You will wonder why you've been struggling with 30th birthday gifts for so long when a gorgeous candy basket could have sufficed. This basket is sure to bring a smile to just about anyone's face because of all of the nostalgic candy products that are contained within it that your friend is familiar with from their childhood. The next time you find yourself struggling to figure out ideas for 30th birthday presents, remember that a simple candy basket is one of the best things you can give to your loved one. You will notice that they absolutely adore receiving this item as a gift and will happily consume all of the delicious candy that is inside. As stated before, a candy basket is also quite affordable and can be an inexpensive gift that your loved one will cherish for years to come. It only makes sense to make use of one of these gift baskets when the big day finally arrives. Getting Over The Hill Has Never Been So Fun!